This photograph was taken quite a few years ago but I clearly remember the light at the scene. My tripod was placed against a vertical wall on one side of a canyon and the camera pointed toward the other nearly vertical wall of the canyon. The sky was clear and the camera faced the general direction of the bright sun. The light had a wonderful quality of brilliance. Landscape photographers often deal with high contrast at scenes when their camera faces the sun. Black and white film offers many advantages in these situations because tried-and-true techniques can be used to reduce high contrast. Techniques include film choice, the use of colored contrast filters, varying film development time, varying controls during film scanning and, of course, digital editing using PhotoShop or other software. These techniques have been discussed in previous blog articles on this website and a few examples can be found here, here and here. I have photographed many landscape scenes that included trees which were backlit by bright sun and it was almost always necessary to reduce contrast to retain image details in areas directly illuminated by the bright sunlight as well as shadowed tree trunks. When I first saw today’s scene I thought it would require a similar technical approach. After looking at the scene, however, it became clear that it was unusual. The sun was located in front of the camera above the far canyon wall so the wall was mostly shadowed. Sunlight illuminated the other canyon wall behind the camera and it reflected sunlight across the canyon to the far canyon wall. The reflected light was quite intense since the canyon was very narrow and it illuminated important shadowed areas such as tree trunks which faced the camera. “Filling” shadow areas with reflected light reduced the contrast of the scene so this backlit scene was unusual since it was easy to record detail in bright areas illuminated by direct sunlight as well as shadowed areas illuminated by reflected sunlight. The scene reminded me of an Ansel Adams photograph which had a wonderful feeling of brilliance. Ansel discussed the brilliance in that photograph by explaining that an impression of brilliance is often conveyed when photos contains very bright and very dark areas against a middle gray background. I thought the light I saw at Sheep Rock Canyon exhibited a feeling of brilliance so I identified “Brilliance” as the primary theme for my photo. I set up my 4inch x 5inch camera and composed a photograph which contained very bright tones from sunlit Cottonwood leaves, sunlit rocks and sunlit pine needles as well as very dark tones from shaded areas of the pine trees. The shaded canyon wall behind the trees provided a large background of middle gray tones. Light meter readings were acquired for key locations of the composition and the dark Pine trunks were placed on Zone III (dark with good detail). The Cottonwood trunk fell on Zone V (middle gray) and bright areas of the shaded canyon wall fell on Zones V – VI (middle gray to slightly brighter than middle gray). Sunlit leaves and sunlit rock fell on Zones VII -VIII (bright with good detail – bright with slight detail). I was impressed by the lack of strong contrast at the scene even though I faced the sun. Amazed at the power of “fill” light in such a large scene, I wrote normal (N) development on the film’s exposure record. The wind was blowing strongly so I paused to think about the shutter speed and f-stop that the scene required. A fast shutter speed was needed to freeze the motion of blowing tree leaves but a small f-stop was needed to obtain adequate depth-of-field. That is, light meter readings gave me plenty of confidence about the exposure required for the scene but I was uncertain about which shutter speed and f-stop combination was best for the exposure. I decided to expose two Tri-X 4inch x 5inch black & white films with the same exposure but different shutter speed and f-stop combinations. One film favored a faster shutter speed (1/125 sec at f/11) whereas the other film favored a smaller f-stop (1/60 sec at f/16). Inspection of both films showed little difference so I selected the film that was exposed with a smaller f-stop. A high resolution digital file was obtained by drum scanning the film at my usual resolution of 5,000 ppi and 16-bit pixel depth. The digital image obtained from the scanner without editing is shown below. I liked the composition but the image lacked the feeling of brilliance that I felt at the scene. Consequently, the primary goal of image editing was to strengthen image brilliance. 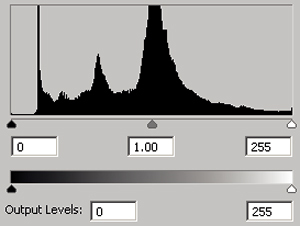 The histogram of the digital image file from the scanner is shown below with dark-to-light tones displayed from left-to-right. 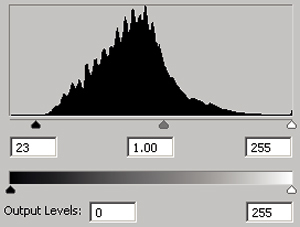 The histogram shows that the scanned image contained the full range of gray tones (0-255 in 8-bit terms) although the vast majority of image pixels were distributed in one broad peak that spanned the middle three quarters of the histogram. The brightest pixels occupied a small peak at 255 along with an extremely small number of pixels near 255. The darkest pixels were found only in an extremely weak, nearly flat peak that was barely visible in the histogram without enlargement. Following Ansel’s lead, my approach to strengthening the feeling of brilliance was three pronged. I planned to increase the number of very bright pixels, increase the number of very dark pixels and narrow the broad peak of mid-toned pixels. First, I had to deal with the bright brush along the left half of the image bottom. The Cottonwood tree was the primary focus of this composition and the bright brush detracted from the cottonwood since it was brighter than the Cottonwood. To make the situation worse, the brush’s location at an edge of the image pulled viewer’s eyes off of the photo. This was a difficult problem and my plan to deal with it involved two approaches. First, the bottom of the image would be cropped to eliminate as much brush as I could. Next, some branches of brush would be edited out of the image and the remaining brush would be burned darker than the Cottonwood leaves. 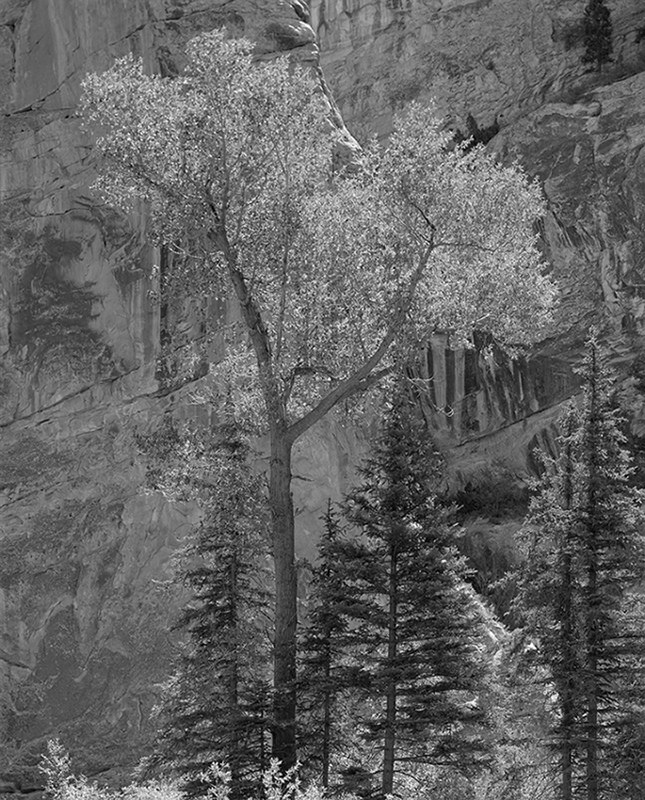 Cropping was executed immediately but the removal and darkening of the remaining brush was delayed until later when image tones were closer to their final values. After cropping was done, a Levels Adjustment Layer was opened to explore the effects of increasing the number of very dark and very bright pixels by moving the Levels sliders as the image was viewed on the computer monitor. The final slider adjustments are provided in the previous Levels Adjustment figure and it shows that the black slider was moved from 0 to 23 but the white slider was kept at 255. In other words, the Levels Adjustment tool worked well for slightly increasing the number of very dark pixels but it did not produce a satisfactory result when increasing the number of the very bright pixels. The image below shows the effects of both cropping and Levels adjustment. Comparing this image to the previous image shows that cropping reduced the amount of brush and the Levels adjustment increased the number of very dark pixels. Next, a Curve Adjustment layer was opened to increase the number of very bright pixels and modify most other image areas as well. The user interface of PhotoShop’s Curve adjustment tool is shown below with dark-to-light tones displayed from right-to-left (the previous histogram displayed dark-to-light tones from left-to-right). The numbers of pure white and pure black pixels were kept the same (by not moving the white and black sliders) but most other tones in the image were changed. The brightest pixels (except pure white) were brightened significantly by bending the curve downward at the lower left corner. This brightened the sunlit Cottonwood leaves and accomplished it more gently than if an abrupt adjustment had been made with the Levels tool. Most other areas of the curve also were modified but the extent of adjustment became less as pixel tones became darker. This can be seen as smaller deviations from the initial straight line as tones become darker. The canyon wall looked too heavy in the previous image so it was brightened a bit more than other tones. This can be seen near the histogram peak where the curve was bent further downward than in nearby curve areas. In addition, pixels corresponding to dark stripes in the wall were darkened more by bending their curve area upward. The image after curve adjustment is shown below. Overall, the curve adjustment increased the feeling of brilliance, brightened the wall and increased the wall’s visual interest. Finally, retouching was performed. This image required an awful lot more retouching than most of my photographs. First, the small tree near the upper right corner was separated better from its surroundings. Tones of the dark tree merged with dark tones to the left of the tree so PhotoShop’s Dodging tool was used to lighten some of the dark tones adjacent to the tree. Comparing the previous and following images shows increased separation although the tiny web images here barely show the edit. Next, a group of brush plants were separated from one another. The brush is located between the two tallest Pine trees a short distance below the image centerline. The brush originally looked like a nearly featureless dark blob so PhotoShop’s Dodging tool was used to lighten some brush areas to help distinguish individual plants. The following image shows increased separation although separation is considerably more visible in larger images. Three areas within the dark Pines commanded too much attention because they were overly bright. Those areas were burned slightly darker with PhotoShop’s Burn tool to reduce their visual attention. The most prominent of these was a very bright area on the rock slope behind the middle Pine. That area along with other bright areas within the dark Pines can be seen by comparing the previous and following images. Next, the lower area of the Cottonwood trunk was brightened slightly with the Burn tool. That edit reduced the visual weight of the Cottonwood and helped it feel more brilliant. Most image tones were now close to their final values so it was time to edit the bright foreground brush as previously planned but delayed. Recall that the image bottom was cropped to reduce the amount of bright brush but the remaining brush still commanded too much visual attention so two steps were planned to rectify the problem. First, brush on the far left was edited out using PhotoShop’s Burn, Dodge, Clone and Healing Brush tools. Second, the remaining brush was darkened using PhotoShop’s Burn tool to reduce its brightness so it was darker than the Cottonwood leaves. I occasionally remove a branch or two from photographs but this photo required an awful lot of editing work that I would rather not have done. Since such drastic editing was required for today’s photo, I gave myself a grade of “D” for acquisition. Spending so much time “fixing” the foreground brush reminded me of the rule, “Get the image as right as possible as soon as possible.” That is, I should have worked harder while capturing today’s image to reduce or eliminate foreground brush so I wouldn’t have to spend so much time sitting at a computer with PhotoShop. For example, I could have pushed the brush down temporarily during image acquisition by laying heavy tree branches on the brush. Comparing the previous and following images shows that the two steps effectively reduced the visual attention of the foreground brush. 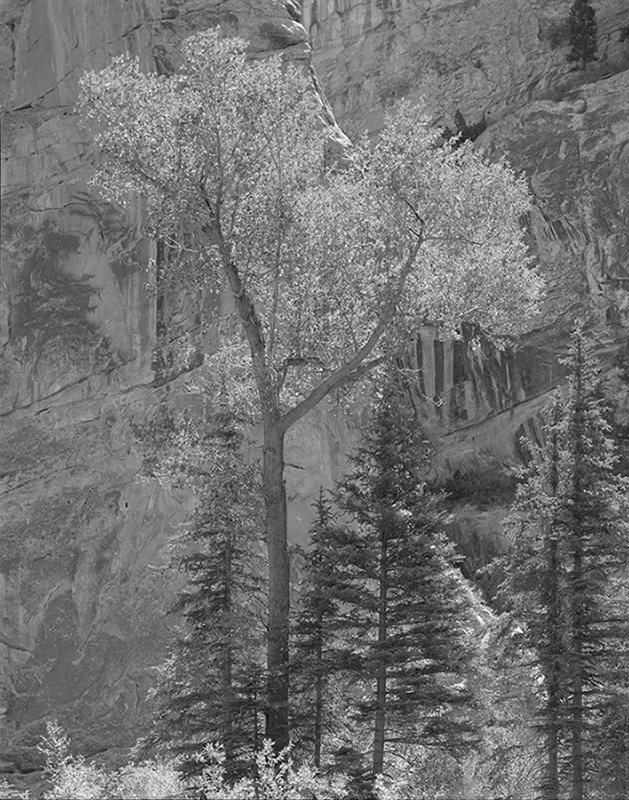 Editing the brush helped keep attention on the Cottonwood tree and greatly reduced the tendency of viewer’s eyes to fall off the bottom of the image. Finally, numerous small objects near the edges of the image were either brightened or darkened with PhotoShop’s Dodge or Burn tools to help keep the eye from falling off the image edges. For example, the topmost sunlit rock at the upper edge of the the image near its center was darkened slightly and small dark rock areas near the top left corner were brightened slightly. The final image with all edits is shown below. Many of the edits discussed above are barely visible in the small web images shown here but are prominent when larger resolution images are viewed. I previously mentioned that Ansel explained that very bright and very dark areas against a middle gray background often impart an impression of brilliance to photographs. Although light at the scene of today’s photo looked brilliant, the image from the scanner lacked that feeling. The histogram of the scanned image revealed the presence of only minuscule numbers of pixels at the bright or dark ends of the histogram with the vast majority of image pixels being distributed in a single broad peak that occupied the middle three quarters of the histogram. In an attempt to follow Ansel’s lead, my editing goal was to strengthen the feeling of brilliance with a three pronged approach – increase the number of very bright pixels, increase the number of very dark pixels and narrow the broad peak of mid-toned pixels. Editing success was evaluated by comparing the initial image from the scanner with the image after editing was completed. Editing success also can be evaluated by comparing the histogram of the initial scanned image (upper histogram below) with the final histogram after all editing was completed (lower histogram below). These show that editing increased the number of pixels in the brightest 10% of the histogram even though both histograms are relatively flat in that area. 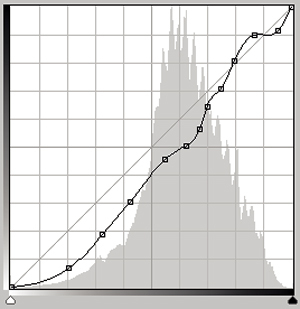 The histograms also show that the number of pixels in the darkest 10% of the histogram was increased significantly by introducing a narrow, sharp peak. Finally, the histograms show that the broad, mid-tone peak was shifted to brighter tones and greatly narrowed. I printed this film in the wet darkroom years ago and was anxious to compare that silver print to the inkjet print produced from the current digital file. Overall, I’d have to say that the digital print was considerably better than the wet darkroom print. I believe the reason for its better quality is the ability to easily make numerous precise digital edits that would be considerably more difficult to make during wet darkroom printing. The subject of this photograph was brilliant light in a narrow canyon and I believe the final image exhibits some of the brilliance which I saw at the scene. Any comments you might have about the image, the photographic approach used for it, its composition, or image workup will be appreciated. For a larger view of this photograph, visit here. Very well thought out & executed image management. Beautiful image. I liked that you mentioned the before and after histograms, as I had not thought of making that comparison in my work. I’d like to ask why you scan at 5,000 ppi? It seems quite high for a 4 x 5 neg. – unless you were going to make prints measured in yards! 😉 This image strongly reminded me of an image I captured at Ghost Ranch, Georgia O’Keefe’s country spot not awfully far to the west from Santa Fe; I think you’d like it there. Thanks for your nice comments, Michael. Answer to your question about why I scan at 5,000 ppi: Scanning 4 inch x 5 inch black & white film at 5,000 ppi and 16-bit pixel depth provides digital image files of nearly 1 Gigabyte. That certainly seems large compared to file sizes obtained by most digital cameras. From a technical point, I’d say that handling 1 GB files (and larger after PhotoShop layers are added) is pretty easy these days with powerful (and cheap) computers. I purchased my computer about five years ago and its RAM size is 8 GB but that is enough to work without trouble except when images have an awful lot of PhotoShop layers. I will upgrade to 16 GB RAM soon since it is cheap. Storing multi-GB layered images requires lots of hard drive space and I have several multi-TB hard drives for that. Again, cheap these days. From a less technical standpoint, I’d say that it sure is better to have file sizes that are larger than needed rather than smaller than needed. A person can’t really predict how a specific image will be printed in the future so why not prepare for the biggest and best? In addition, I often edit using very large magnifications on my computer monitor and having spatial details defined more precisely with larger resolution makes editing easier. Many of my photographic subjects are enormous landscape scenes that look better in large prints rather than small prints and, of course, large prints require more resolution than small prints. I like to print with 600 ppi rather than 300 ppi resolution even when making large prints. People can inspect my prints from a far distance or up close with a magnifying glass if they wish and they will see smooth, pixel-less transitions. I also suspect that printers will evolve in the future so they print better using higher resolutions. Overall, I scan at 5,000 ppi because it is technically easy if you have the equipment, it is the maximum optical resolution that my drum scanner produces, I only have to scan once to produce any print size, it makes editing easier and I can make high-quality, large prints. Randy, I’ve tried to direct a couple of folks to your blog comments but cannot find an easy way to access a listing of your archived posts. Is there a link that I’m missing or do we always have to scroll all the way to the bottom of a blog post to find the archives.